Worms/Troisdorf, August 20, 2015 | The need for barrier film is growing worldwide and so are the requirements for film properties in high- quality barrier packaging applications. Parallel to this, producers are demanding high production flexibility to serve the market with different products. Reifenhäuser Blown Film’s answer to rising performance requirements is the development of a highly flexible and efficient +. 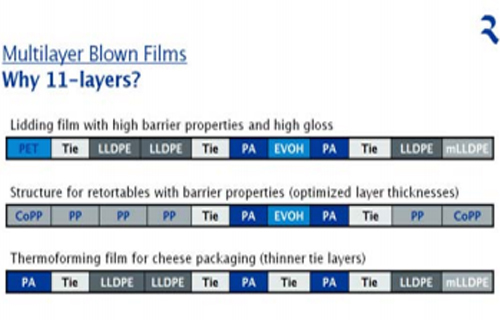 Thanks to the variable choice of layer structures offered producers by an 11-layer blown film line, there is no need for the time-consuming and costly laminating step in the conversion of some products. Furthermore, the greater flexibility achieved with more layers often results in a higher overall performance when processing polyolefins. “But it gets even better”, says Ralf Wiechmann, Product Manager at Reifenhäuser Blown Film GmbH: “We have developed a screw design for our extruders that can effortlessly handle almost every polyolefin type and every barrier raw material without modification of the machine.” Therefore, product changeover becomes as simple as child’s play: purging the line, changing to a new recipe and just watching another barrier film being conveyed to the winder. In this way, also comparatively small lot sizes of speciality film can be economically produced. Another special feature of the 11-layer line is its innovative design. A skilful choice of an asymmetric high barrier structure (see ill.) by the producer can almost completely prevent curling of the film without using a normally required water bath (critical with regard to hygienic production conditions). Curling of the film edges is caused by the different speeds at which raw materials cool down. Furthermore, the specially developed EVOLUTION Ultra Flat haul-off ensures high winding quality and fast, smooth further processing, such as conversion, laminating and printing. Thanks to a minimized stretching of the film via heating-cooling rolls, a perfect flatness of the web can be achieved with this technology. For an optimum distribution of the eleven layers Reifenhäuser Blown Film has developed a special die head based on the proven Reifenhäuser technology. The individual adjustment of layer thicknesses allows for an ideal distribution of the raw materials depending on the product. 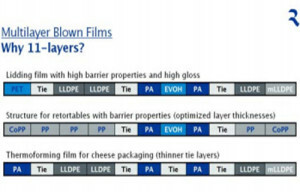 In a similar way, this is also valid for the energy efficiency measures Reifenhäuser Blown Film offers for their 11-layer line under the keyword “Blue Extrusion“. Investments in these optionally selectable measures pay off very fast due to the required high operating temperatures of 200 to 270°C. For example, producers who opt for highly efficient electric motors and gearboxes, insulation/damping of cylinders and heater bands, or the customized design of a complete production line with a focus on targeted energy optimization, can save energy and reduce production costs. Interested persons have the opportunity to witness the advantages of the 11-layer EVOLUTION line live in the Blown Film Technology Center at the Troisdorf site.